The Opportunity rover continues its journey through endless plains of iron and silicon oxides. 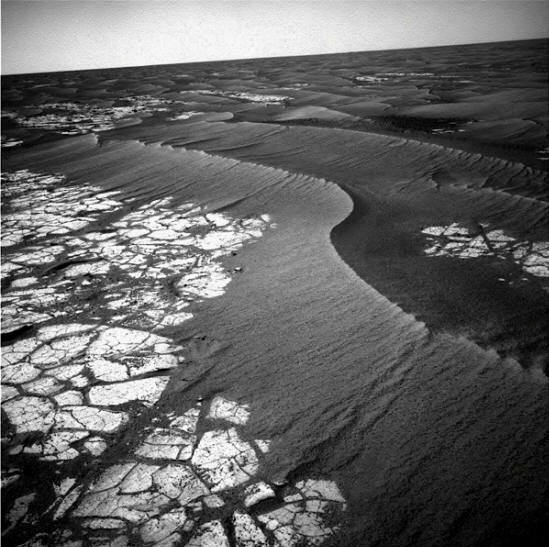 The Mars Exploration Rover, Opportunity, has been rolling for six years through a sea of hematite nodules that overlay fractured stone slabs. Since its landing in Eagle crater on January 24, 2004 Opportunity has traveled a total distance of 21.83 kilometers at an average speed of 9.5 meters per day. It has far exceeded its original mission timeline of 90 days, providing a wealth of evidence that supports Electric Universe concepts of planetary scarring events in the recent past. For many years, mission specialists have struggled to explain the geological morphology of Mars, especially the vast accumulations of hematite nodules otherwise known as "blueberries." 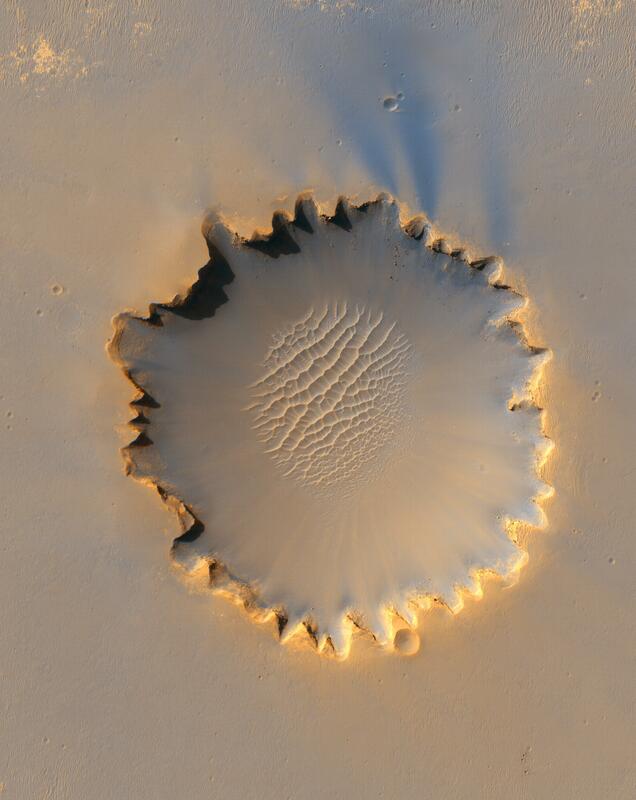 In the image above, the incongruous spherules are seen heaped into sinuous dunes that cover thousands of square kilometers. On its way to the rim of Victoria crater, and continuing to this day, fields of the dark dunes and white, polygonal blocks of stone have dominated the landscape. The silicon dioxide blocks were dubbed "cobbles" or "pavement" because they are flat compared to the undulating piles of hematite gravel. Indeed, the wide avenues of stone appear to underlie the iron-rich pellets. Previous Picture of the Day articles highlighted the dune fields on Mars, their carved faces, and the craters associate with them. Since standard geological and astrophysical theories offered no explanations except those that depend on comparisons with Earth-based formations, it was concluded that electricity is the one unifying factor that explains how they all might have been created. The quartzite pavement is split into regular polygons with wide cracks that are most often filled with hematite blueberries. They exhibit fractures that radiate in concentric arcs from what appear to be hollow impact zones, and have been roughly etched, or eroded away on top. The cracks have edges that are sometimes razor-sharp. Many are undercut. Several seem to have been sliced off at ground level from large blocks composed of the same material. The big chunks also contain great quantities of blueberries embedded in them. The presence of iron oxide in several forms indicates that something not taking place on Mars today did take place at some time in the past. Some have speculated that there was once a dense, oxygen-rich atmosphere that allowed for “rusting” of the iron in its crust to occur. Others have said that there were oceans of open water on the surface that helped to form the trillions of hematite nodules that cover nearly an entire hemisphere. Whatever the cause, some hematite dunes rise up to nearly a kilometer in height. There are giant cracks that go on for hundreds of kilometers with their bottoms covered in hematite ripples. Seas of hematite dust tens of meters deep engulf craters a hundred kilometers in diameter, many of them associated with silicon dioxide pavement.